These are from a Tesco Finest Free From Salted Caramel Easter Egg, which is a bit of a mouthful, but a delicious one! A bit of a jump too, from what was available in supermarkets last year, with those white chocolate truffles. Despite what the blog might suggest, we haven’t just been living on Easter chocolate and trying to claim it as ‘seasonal eating’. Soup is such a staple just now as we come to the end of winter. See our page of soups here. Winter is ending. We are convinced of it. Sunsets are later, and sunrises, like the one through the trees below, are earlier and earlier! Bendicks mints with Morrison’s Gianduiotti. Yes, more of the garden comes inside every day! Today we have Christmas tree shaped pretzels from Aldi. 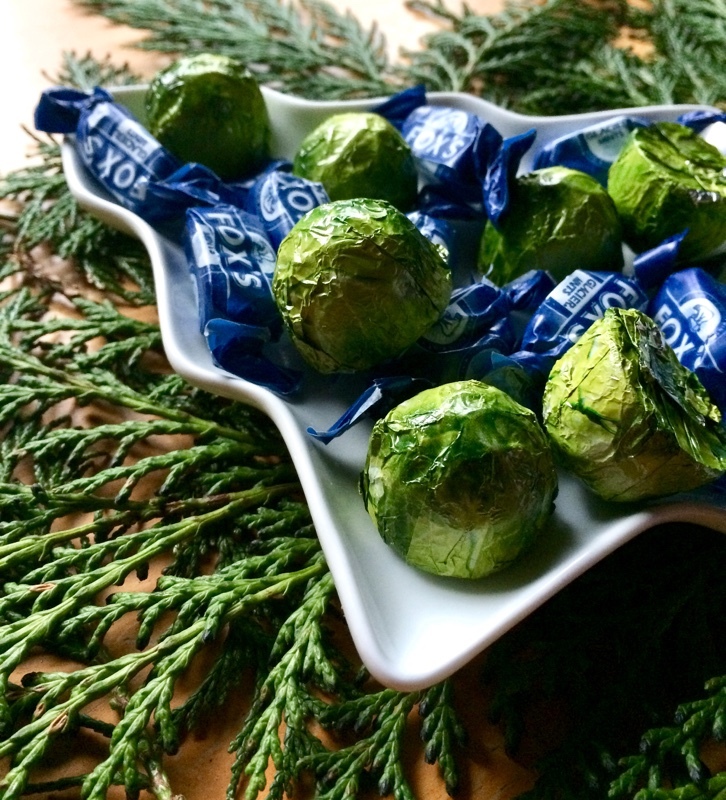 Chocolate truffles dressed up as Brussels sprouts from Asda alongside Fox’s Glacier Mints. These Christmas Dish posts are evolving. Something homemade may even appear at some point, but for just now we’re adding one of our festive recipes each day. Today: Vegan Bread Sauce (goes well with the sprouts). See all Christmas Dish posts. We’re eating lots of carrot soup and reading The Telling. Beautiful apple, kale and bramble (blackberry) juice above. The wonderful summer has produced SO many apples, so many that a branch snapped under the weight! They’re perfectly ripe now so we’re busy juicing and making pies and chutney. And just eating them… that’s probably the best. Badger and deer are clearing up the windfalls. We’ve also been enjoying semi-blended soups just now consisting of ingredients such as tatties from garden, carrots, leek, garlic, broccoli, parsnips and peppercorns. Similar to this root soup recipe over on frugal. Yes. Frozen vegan pizza from GoodFella’s. It’ll be on supermarket shelves in April, retailing at £2.50, Vegan Society trademarked, and we can verify that it is delicious! It was perfect on a day like this, when there had been some trudging through snowdrifts. Then the courier made it through with our pizzas! The crumbled falafel topping makes the pizza dense and satisfying and goes so well with the spinach, always a sturdy inclusion to Italian food. The hummus drizzle is garlic-y and cheese-y and perfect too. We paired it with leek and potato soup, and with each pizza serving two, that made a big and filling meal. This will be a great dish to have on standby in the freezer for busy (or lazy!) days. Okay snow, we’re ready for you again! Eating: a simple trifle made of bananas in vegan jelly, topped with thick custard and this rather nice provamel cream (we were lucky enough to find a few of these cheaply on Approved Food recently). There’s a more detailed trifle recipe on the Vegan Christmas page. Reading: Manda Scott’s Boudica series. Wonderful skies just now. Especially on the coldest of days. Wonderful smoothies too, made possible by the wonder of frozen fruit. The combination of pecan nuts and tart purple berries such as brambles (blackberries) or blackcurrants creates a delicious and rich sweetness reminiscent of the best brown sugar. If you like a thicker smoothie add an avocado or some linseeds. Blend! Enjoy the brown sugary wonder! Go for a walk among the trees! Bramble, quantities are for four people, adjust as required. Ingredients: a quarter blender jug of brambles (blackberries); 100g of walnuts; 5 bananas; 1 large apple; orange juice to cover. Blend and enjoy the tart sweetness of the season. Beauty by Sheri S. Teper. A stunningly well written, time-jumping, retelling of the sleeping beauty story for adults with a strong environmental message. Gourmet Vegan Cheeses above and a book and hot chocolate below! Don't miss GreenBay Vegan Supermarket for gourmet products such as the cheeses below! Online supermarket Ocado have an awesome vegan aisle and £20 off your first order! great vegan titles at bargain prices! An amazing energy-saving device, this Halogen Oven cooks quickly and needs no pre-heating. Comes with lots of accessories and is a snip at £25! (Price right at time of writing, Dec '14). A great guide to Britain's wild foods. vegan recipes, books and festivities… Among the trees in Scotland. Visit Vegan Family House's profile on Pinterest. Our sister site Frugal Living in the UK boasts a plethora of thrifty vegan recipes such as the wild garlic and carrot soup pictured below. The Help Yourself Cookbook for Kids by Ruby Roth: 60 Easy Plant-Based Recipes Kids Can Make to Stay Healthy and Save the Earth. Get your first Graze box free! lucy on All the Vegan Food! Chestnut Candle on All the Vegan Food!